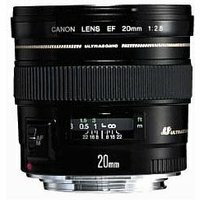 The Canon EF 20mm f2.8 USM Lens is a versatile lens that delivers superb wide-angle images in any scenario. With its wide-angle field of view and extended depth of field, the EF 20mm f2.8 is a great choice for photographers on the move shooting landscapes, architecture or reportage. Easy to hold and carry at 405g, the 20mm lens is exceptionally portable and offers a maximum f2.8 aperture to allow flash-free photography and sharp shooting in low light conditions. The Ultra Sonic Motor (USM) ensures quick autofocus and in near silence. Furthermore, full-time override is available, making it possible to adjust focus without leaving AF mode.